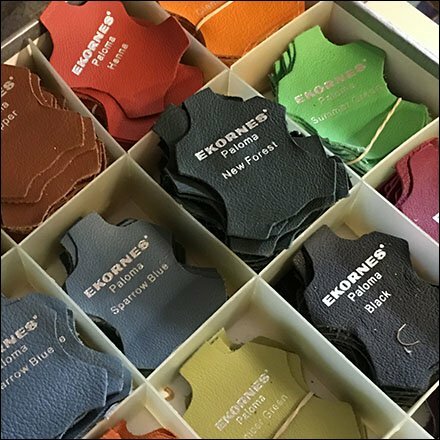 If you offer top-of-the line leather upholstery in near unlimited colors it pays to display choices as with these Leather Hide Fabric Color Samples by Ekornes. And shaped like a cow hide they immediately say “leather.” With such fancy samples, the container need not be overly impressive. In this case cardboard handled the job nicely. This Leather Hide Fabric Color Samples by Ekornes merchandising aid seen at Dane Decor, Downtingtown, Pennsylvania.